Ronda sits in the heart of the Serrania de Ronda, about 100kms from the city of Malaga and with a population of approximately 35,000 inhabitants. Surrounded by lush river valleys and sitting above a deep ravine, it is a place that literally takes your breath away when seeing it. 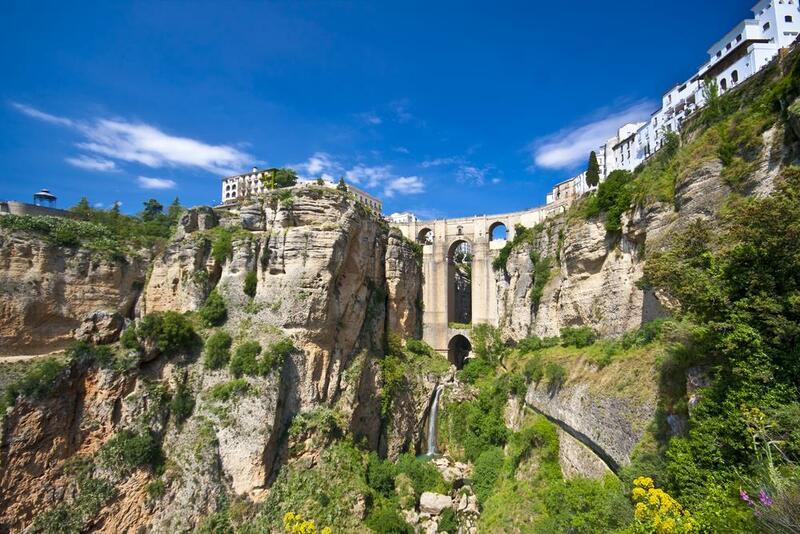 Anyone who has been lucky enough to visit Ronda will understand its appeal. It is one of the most beautiful and visited cities in Spain (the third most visited city in Andalucia) and a very popular day trip for people on a Costa del Sol holiday. Ronda (Acinipo) was first declared a city by Julius Caesar in the first century AD. When the Moorish troops under the command of Tarik-ibn-Zeyad invaded the region in 8C, one of the first routes they followed was the old Roman one, linking Gibraltar with the Roman settlement of Acinipo. They renamed the town to Izna-Rand-Onda - Ronda. The ruins of Acinipo actually sit 20Km outside of modern-day Ronda. Here are 12 must-sees for your trip to Ronda, but if you want to get the real feel for the city find some accomodation in Ronda and stay here for more than just one day. Let yourself enjoy long walks around the city, take your time to have a dinner with an amazing view and pay a visit in one of many bodegas located in the area. Offering unforgettable views over the El Tajo gorge. The Puente Nuevo – new bridge – was actually completed in 1793 and took forty two years to build. The bridge joins the old Moorish town and the newer, El Mercadillo parts of the city. It is, by far in a way, Ronda’s most famous landmark. One of Spain’s most famous Parador hotels sits adjacent to the bridge and is a well worth a visit. The views of the El Tajo gorge are unforgettable. If you have the time, walk down into the gorge along the Camino de los Molinos. The views are the best to be had. In Spring the whole valley floor is awash with flowers. Ronda is said to be the home of modern day bullfighting. The Real Maestranza bullring is one of the oldest and most picturesque in Spain. It was built in 1785 by the architect Jose Martin Aldehuela - the same architect who built the Puente Nuevo. The ring can hold up to 5000 spectators. Francisco Romero, born in Ronda in 1695, is credited with giving bullfighting its modern-day rules with the introduction of the cape and the muleta. His grandson, Pedro Romero (1754-1839) became one of Spain’s greatest bullfighters. He founded the Ronda School for Bullfighting, it is still known today for its classicism and strict adherence to the rules. 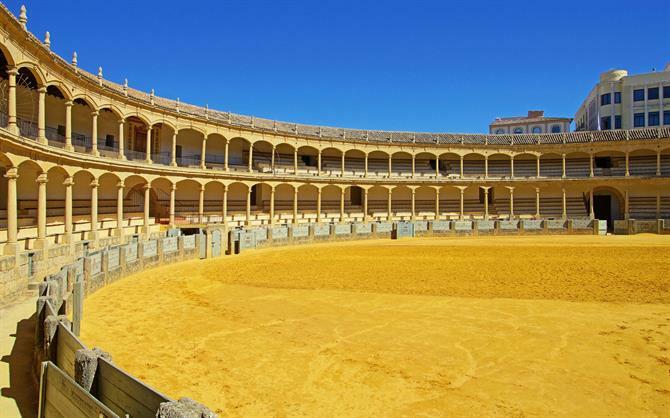 There’s a museum and guided audio tours around the bullfighting ring. The price of entry is 7.00€ per person and 8.50€ with an audio-guide. 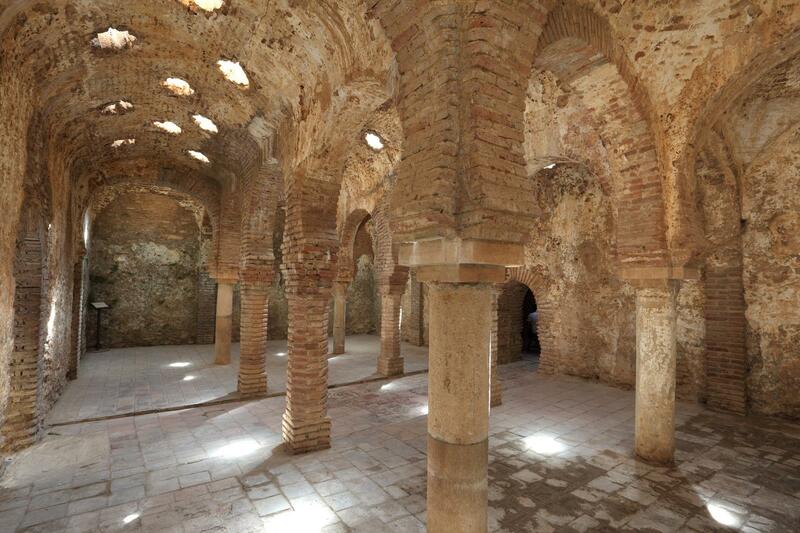 The Arabic baths in Ronda are the best preserved in Spain. They were built at the end of the 13th century during the reign of King Abomelik. The large cauldron used to heat the water is still visible and in good condition. The star-shaped vents in the roof were modeled after the ceiling of the more famous bathhouse at the Alhambra in Granada. The baths are located in the old Arab quarter of the city, known as the San Miguel Quarter. Address - Calle Molino de Alarcón, s/n. Entrance is 3.75€ per person. The Mondragon palace is home to the municipal museum and some truly outstanding gardens. Built originally in 1314 by the Moorish King Abomelik, it was later used a the primary residence for Queen Isabella and King Ferdinand. The museum is devoted to Ronda’s rich history with examples of Roman and Moorish tombs. The gardens are exceptionally beautiful and offer a real island of tranquillity. Address - Plaza Mondragon, 5. Entrance costs 3.75€. On Tuesdays there is free entry from 3pm for EU citizens. Legend has it that this was the residence of the Moorish King, Almonated, who is said to have drank wine from the skulls of his enemies. Although more recent evidence seems to indicate that the King never actually lived in the building. Today’s structure was completed in the 18th century and completely remodeled in 1920 by the Duchess of Parcent. The gardens were designed by the same French architect who designed the Maria Luisa Park in Seville, Jean Claude Forestier. The gardens give access to La Mina (the mine), an Islamic staircase of 231 steps which have been careful cut into the rock and lead down the river. These steps played a vital part in Ronda’s history, it was at this point that Christian troops forced entry in 1485. Address - Calle Santo Domingo, 9. 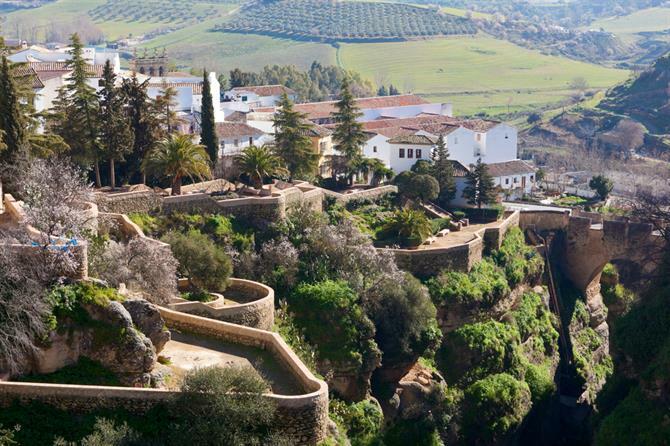 Throughout history, Ronda has been one of Andalusia’s most impregnable cities. Mainly owing to its geographical position, but also to a series of city walls and gates which were built by the Moors throughout the Islamic era. These walls and gates were continually being added to as the city grew. Today, they provide a unique glimpse into Ronda’s past. Visitors in Moorish times to Ronda would have entered the city via the Puente Arabe, eventually entering the city centre by going through the now decrepit Puerte de la Cijara. 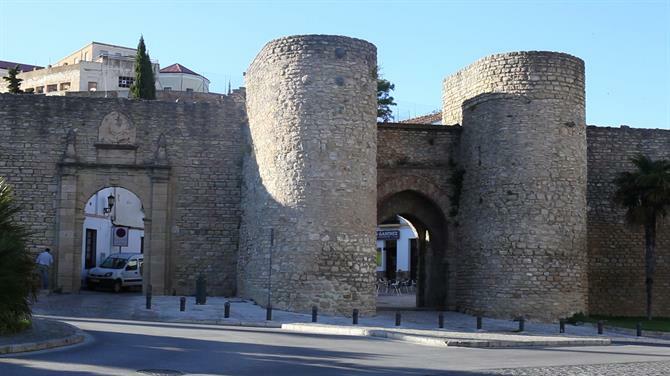 The largest and most protected city gate was the Almocabar one. It took its name from the Arabic cemetery (al-maqabir) which stood in this section of the town. The Almocabar gate faces Gibraltar and the sea and would have been a main point of entry for most people. The Murallas del Carmen is particularly picturesque and has recently been reformed. It sets the scene numerous cultural events and has the Iglesia del Espíritu Santo, the Church of the Holy Spirit standing just next to it. Plaza Duquesa de Parcent is Ronda’s most picturesque square and one that is brimming with monuments. The Santa Maria del Mayor church is the highlight, a church which took over 200 years to build and is a mixture of gothic and Renaissance styles. 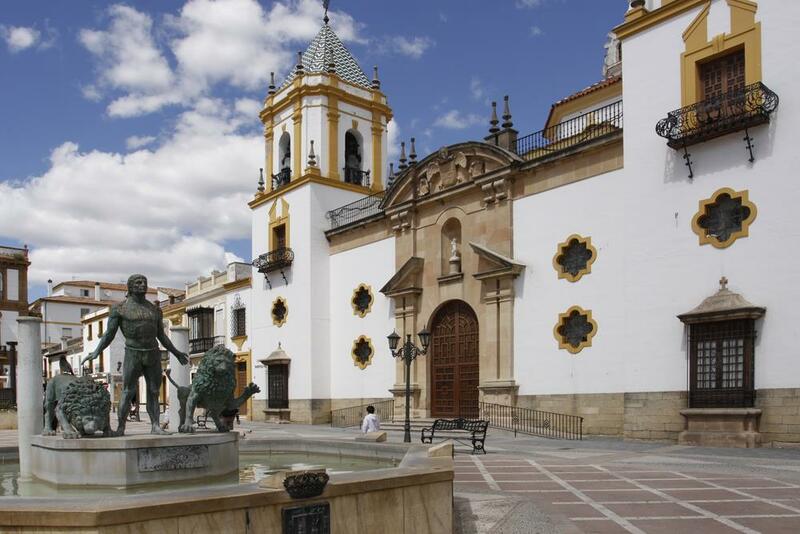 Other squares that come recommended are Plaza del Socorro (pictured above), the square in front of the Almocabar Gate and around Calle Nuevo. 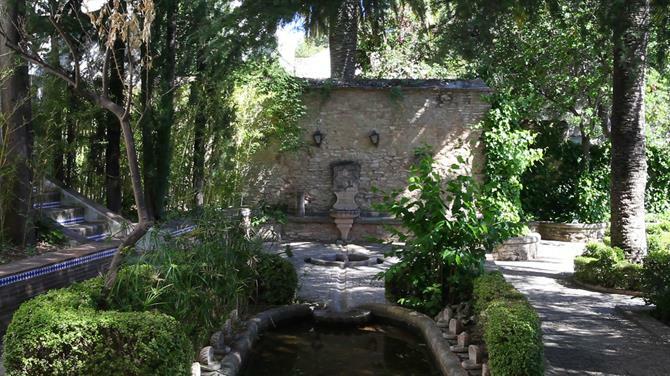 The Cuenca Gardens are located on the ledges of the Tajo and distributed across a series of terraces. The views are fantastic and give you a unique and differing perspective of the city. The terraces have been dedicated to Ronda's sister city of Cuenca. An agreement that was originally signed between the cities in 1975. One of the most popular viewpoints of the city and with good reason. The views of the gorge, the Puente Nuevo and the surrounding countryside are spectacular. The viewpoint has been named in honour of the architect José Martin de Aldehuela. The same architect who built the bullring, the Puente Nuevo and finished Malaga's cathedral amongst other projects. The Balcón del Coño viewpoint is another that should not be missed. Twenty kilometres outside of Ronda sit the ruins of the old Roman settlement of Acinipo. A large theatre dating from 1C AD and several houses are clearly distinguishable. The name 'Acinipo,' means the 'city of wine,' and was one of the few cities in the Roman Empire that made wine that was exported back to Rome. 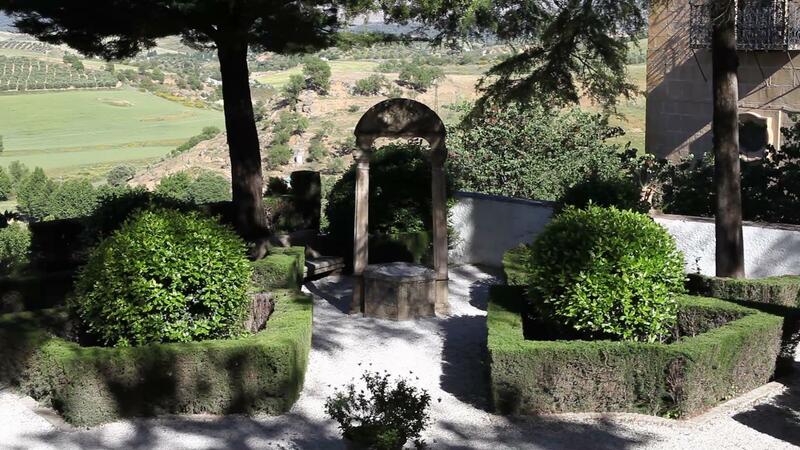 Address - Carretera de Sevilla (20 kms from Ronda). Entrance is free. Ronda isn't all about history and culture, it is also home to some fantastic wineries. 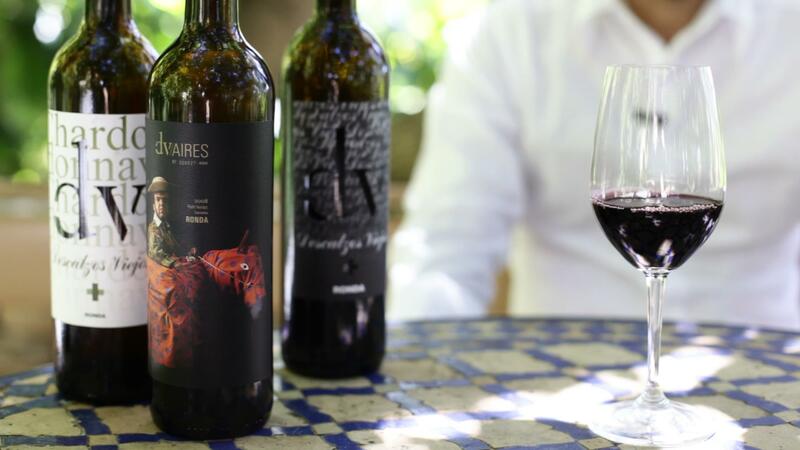 Ronda is one of the most recent additions to the official wine routes that can be found across Spain and its future is looking promising. Here's a recommended wine route in and around Ronda and for something that is right on the city's doorstep, a visit to the Descalzos Viejos winery is a great way to spend the morning. Looking to cool off after a hot morning's sightseeing in Ronda? The Cueva del Gato - the cat's cave - is just the place to do it. The most recent addition to Andalusia's list of Natural Monuments, the river pools provide an unbeatable spot for a swim and a few hours in nature. The Cueva de Gato is about 20 minutes drive from the centre of Ronda. If looking for a fantastic and very easy spot to get to for a picnic and swim. The Cueva del Gato is just the place. One of the youngest wine regions on the national wine circuit, a visit is not to be missed. Getting to Ronda is just as good as being there. Our private tour of Descalzos Viejos, a 16th century monastery converted into a bodega, in the beautiful town of Ronda, Andalusia.